16 + 18 x 18", 45hp engine, Hyslop & Ronald. Colpoys Bay, Georgian Bay. Lake Huron. Bound Wiarton from Meaford, ONT, lost in gale; salvage found on White Cloud Island. 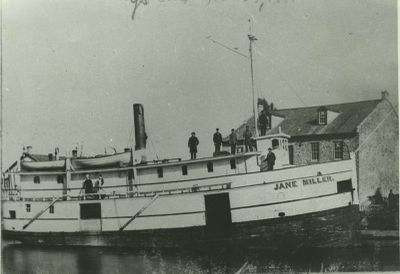 1879, Jul 29 Registered Collingwood, ONT; Built at Crop's Shipyard. 1880, Jun Owned Andrew Port; ran Owen Sound, ONT - Wiarton, Bruce Peninsula & South Shore Manitoulin. 1880, Oct Ashore, head of Michael's Bay. 1881, Nov 25 Foundered Colpoy's Bay near Meaford, ONT.